This is the regular gold priced in Pound Sterling update. The last update was in August 2012 and can be found here. The Nominal Gold Price is currently £1,051.97 which is 2.4% below the November 2012 Price of £1,078.37. Year on Year Nominal Gold is 0.3% below the December 2012 Price of £1,055.00. So over the past year in nominal terms gold has gone precisely nowhere. This demonstrates nicely one of the negatives of holding gold compared to equities. If equities go nowhere price wise for a year you can still sleep easy knowing your equities (ie real world companies) are (hopefully) making profits. Some of those profits are then (hopefully) spun off as dividends, particularly if your allocation to equities is HYP based, which gold doesn’t give you. 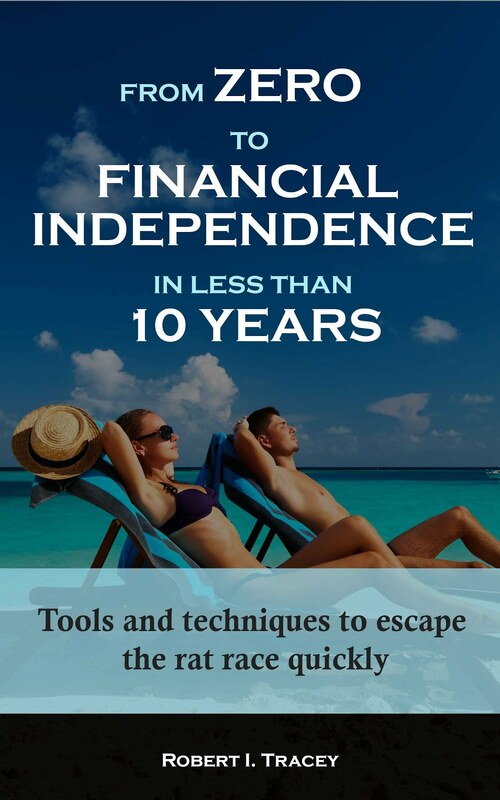 That said I’m not changing my strategy and will continue to hold gold because of its diversification benefits. 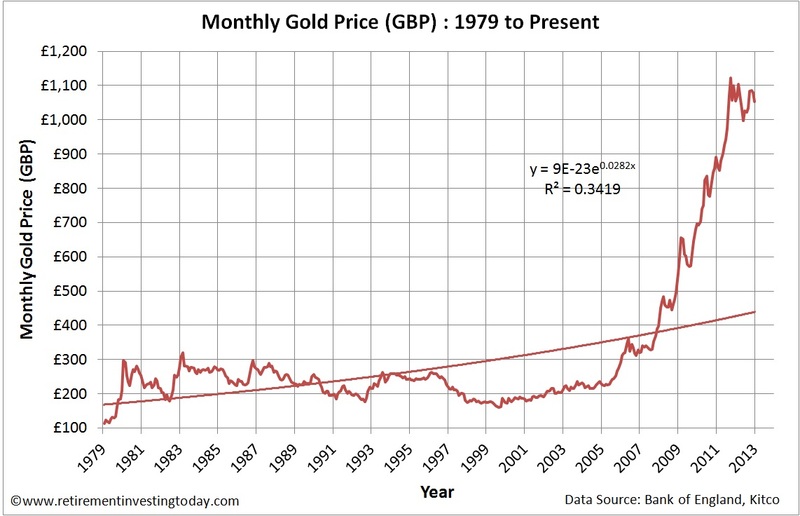 Real Gold Peak Price was £1,189.97 in January 1980. At £1,051.97 we are 11.6% below that peak today. The long run average is £533.02 which is indicating a very large 97% potential overvaluation. 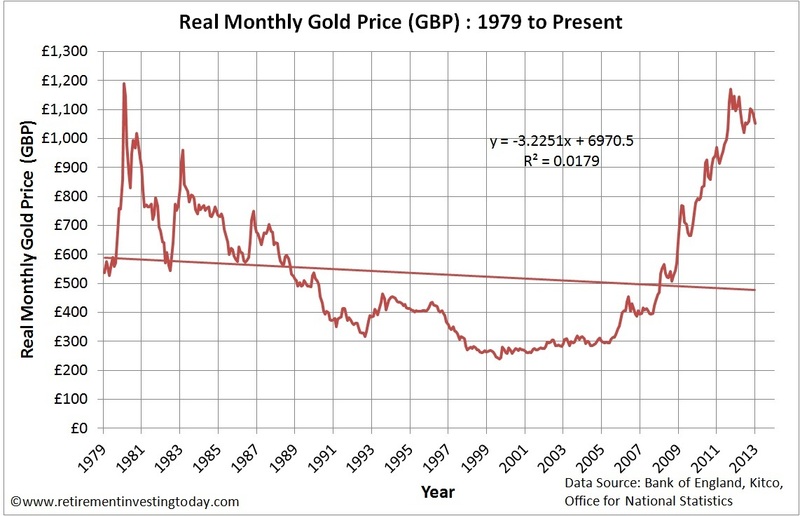 The trendline indicates the Real Gold Price should today be £478 which would indicate even further overvaluation today. So where do my gold holdings sit today? 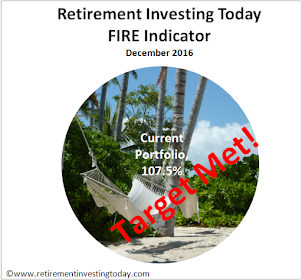 I’m at a 4.6% holding, when compared to total portfolio value, against a target of 5.0%. Last gold price actual taken midsession on the 04 December 2012. November and December 2012 inflation is extrapolated from the Retail Prices Index (RPI).